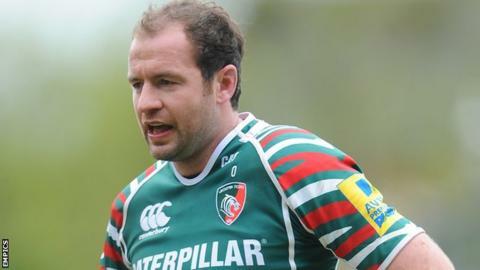 Leicester Tigers captain Geordan Murphy is set to return from a knee injury in Saturday's match against Gloucester. Full-back Murphy suffered the injury in September's draw with Saracens, but will return for the Premiership game. "Geordan Murphy will be fit," Tigers director of rugby Richard Cockerill confirmed to BBC Radio Leicester. "He wasn't far away last week but the other guys have been playing well. "Geordan at 100% is very, very good so he'll come back in." The former Ireland international, who has played 305 times and scored 657 points for Tigers, has been replaced by countryman Niall Morris and New Zealander Scott Hamilton during his enforced absence. He will be a welcome return among the Leicester ranks who came in for some criticism for a lack of leadership in their opening Heineken Cup match at Toulouse - which they lost. Cockerill's squad responded with a convincing win against Ospreys last weekend but they still have some lingering problems with injuries. "Apart from him [Murphy] we've got Tom Croft and Miles Benjamin out, but the others are fine as far as I'm aware."